With cities growing bigger and local travel time getting longer than expected, the concept of mixed-use developments is gaining momentum and millennials are celebrating. While mixed-use spaces are known to be use as a tool to bring out individuality and work-life balances for employees, there are three major factors why office space in such development is on a rise. But first, what are office spaces in mixed-use developments? Mixed-use development is a type of urban development that blends residential, commercial, cultural, institutional, or entertainment uses, where those functions are physically and functionally integrated, that provides pedestrian connections. With single-use spaces being the norm for decades, the mixed-use spaces are now a more sought after option by workers and employers alike. The new era of employees a.k.a millennials are demanding more work-life balance and more benefits from their workspaces. They care a great deal for the company’s culture and the kind of work that is expected of them. Today, businesses are investing and designing an office to suit the portrayed culture to attract the cream of talent and also retain them with perks and benefits of an office space that is multi-purpose and easy to use. With mixed-use office developments, stand to benefit in multiple ways with the most important benefit being - convenience and walkability. As cities grow & traffic builds, businesses have realized that time is essential & picking an office space that encompasses multiple facilities is now the need of the hour. 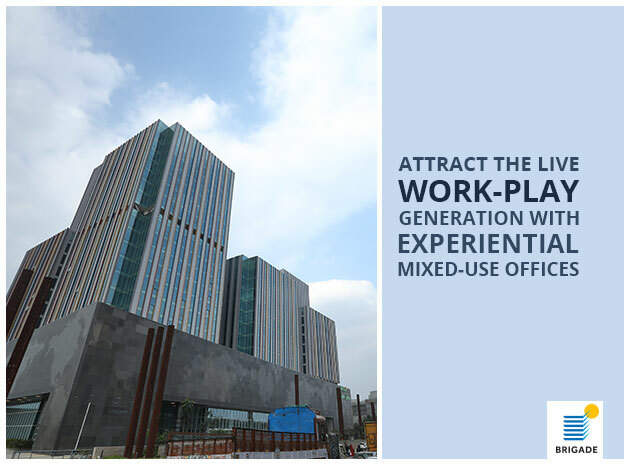 Mixed-use office spaces provide a holistic work-live-play atmosphere that millennials seem to crave in today's era. Keeping this in mind, Brigade has conceptualized many such office developments and one of them is Signature Towers at Brigade Golden Triangle, Old Madras Road. This is an integrated office enclave set in one of the most accessible localities of East Bangalore and a few minutes away from Whitefield, the IT hub of Bangalore. This development includes residential apartments, Orion OMR Mall with shopping, entertainment and many F&B options coupled with Holiday Inn Express & Suites making it the right choice for businesses looking at a workplace that serves multiple purposes. While we understand the importance of mixed-use spaces in terms of balanced work culture, attracting the right candidates and retaining them is another aspect that benefits the community. Mixed-use spaces revitalize communities and encourage private investment. They are also instrumental in increasing property value, promote tourism and support local business development.